Registration begins Aug. 10 for this year's Move More Challenge, stepping off in September. Use your Fitbit to track your steps, be eligible for prize drawings and earn an incentive for your 2017 health plan. “Check this out,” David Pugh says, firing up his smartphone and opening up his Fitbit app to show you his steps from the week of July 18. That was the week that Pugh, vice president for space planning and construction for Emory Healthcare, was focused on coordinating the details to erect the new pedestrian bridge to connect Emory University Hospital with the Emory Clinics and the new J-wing expansion, as well as getting ready to top out the ninth and final floor to the new building. Ever since the 2015 Move More Challenge, Pugh has been dedicated to achieving his activity goals on a daily basis, striving to reach 13,000 steps each day. Pugh finds it fitting that he tracked his highest number of steps yet (128,248 steps in one week) while preparing to raise a bridge that will support walking. His work in overseeing the Clifton Campus expansion already had him running around, but the Move More Challenge helped him focus on setting goals to improve his own health. 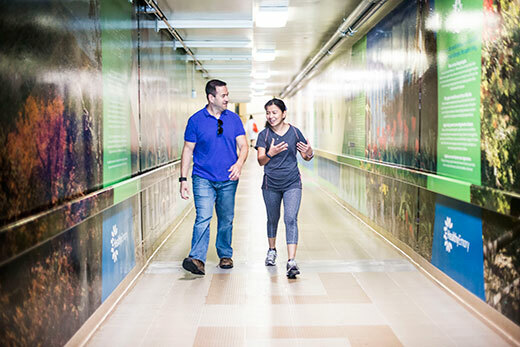 It’s that vision of employee health and well-being that inspired Healthy Emory to partner with Fitbit in the first place, and it is what propels the return of the Move More Challenge this fall. Registration begins this week for the second annual challenge, which kicks off Sept. 19 and runs through Nov. 13. “We asked, ‘How can we, as a leading academic center and health care innovator, create a model for health and well-being in our own community?’” says Michael Staufacker, director, health management for Emory. In 2015, more than 6,000 employees from Emory University and Emory Healthcare walked a combined total of over one million miles in the inaugural Move More Challenge. Participants averaged 9,116 daily steps. 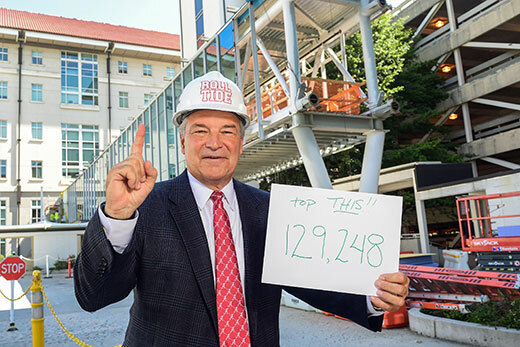 David Pugh, vice president for space planning and construction for Emory Healthcare, logged almost 130,000 steps in one week last month and credits the Move More Challenge with helping him set goals to improve his health. This year's challenge follows a similar format. Participants can choose from seven Fitbit devices that are available to them at a reduced rate, thanks to a subsidy provided by Emory, or use a previously purchased Fitbit. Once registered, participants are assigned to teams based on their operating unit or department, which not only creates a sense of fun and friendly competition within Emory, but also creates a built-in support network. Registration for the 2016 Move More Challenge starts Wednesday, Aug. 10, and runs through Friday, Sept. 9. Employees will soon receive information at their home and in their email inbox on how to register, purchase their devices and begin moving more. And, new for this year, there are additional incentives for participation, beyond the prize drawings that happen at weeks four and eight. All participants who average at least 5,000 steps per day for every week of the 2016 Move More Challenge will receive an incentive towards their Aetna medical plan. Those in the HSA plan will receive a $100 credit to their health savings account. Those in the POS plan will receive a $100 credit toward their deductible and/or coinsurance. For more information, visit www.emory.edu/MoveMore or contact HealthyEmory@emory.edu.